This article is about creating an encrypted ESXi datastore out of existing storage you have in your ESXi server. But the first half is really just how to create an LUKS encrypted LUN in Debian and share it out via iSCSI, so if you just need that, ignore the rest. The reason for me wanting to do this is that I have three virtual machines which contain sensitive data, and really need to be encrypted. If I do full disk encryption on the virtual machines, it blows my Veeam backup sizes up a LOT. Veeam can no longer de-dupe or do changed block tracking. Because I replicate these virtual machines over the WAN to another system in a datacenter with my pathetic 40Mb/s upload speed, this really wasn't something I could give up. The other option is to setup vSphere encryption, but it's a big setup and requires KMS servers, a bunch of messing around with certificates. I decided to use Debian for this as its what I am used to. I used to use Ubuntu but it took a turn for the worst with version 18, so I made the switch to Debian 9 which has been great. So far its almost 100% the same, but without the crap. So if you are using Ubuntu, these steps should work fine. Move along selecting the default options and write the changes to LVM. 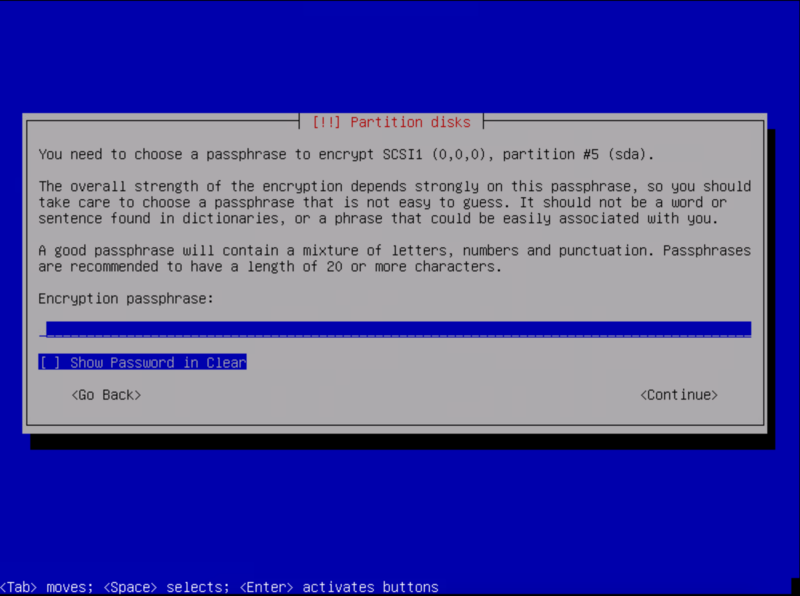 When you reach the point of entering a passphrase, make sure its a good one! From there finish the setup using the default options, or whatever options you want. Now go ahead and reboot, and then connect to the VM via SSH. Now go ahead and create a volume group, you should see the confirmation output below. I name my volume group "fs-secure_iscsi"
Now we want to encrypt that volume we just made, run the following. You can see the naming convention you need to use. If you are unsure, you can go to /dev/mapper and list the contents and you should see the volume name in full. drwxr-xr-x  2 root root     160 Apr 11 19:47 .
drwxr-xr-x 18 root root    3200 Apr 11 19:47 .. This will overwrite data on /dev/mapper/fs--secure_iscsi-fs--secure_lun1 irrevocably. sudo cryptsetup luksDump /dev/mapper/fs--secure_iscsi-fs--secure_lun1 | grep "UUID"
Make a new line under the existing entry, and enter the following. Remember to change the UUID, and if you want the encrypted volume named something else, change the iscsi_crypt text. Now go ahead and reboot the system. When it comes back up go to /dev/mapper and see the contents. You should see your mounted volume listed. This part is actually very easy. We already installed tgt in the first few steps, so we just need to make the configuration. The next line is the backing for the iSCSI target, this should be the encrypted LUN we mounted. Next we need to mount it in ESXi, if you are mounting it somewhere else, we are done! 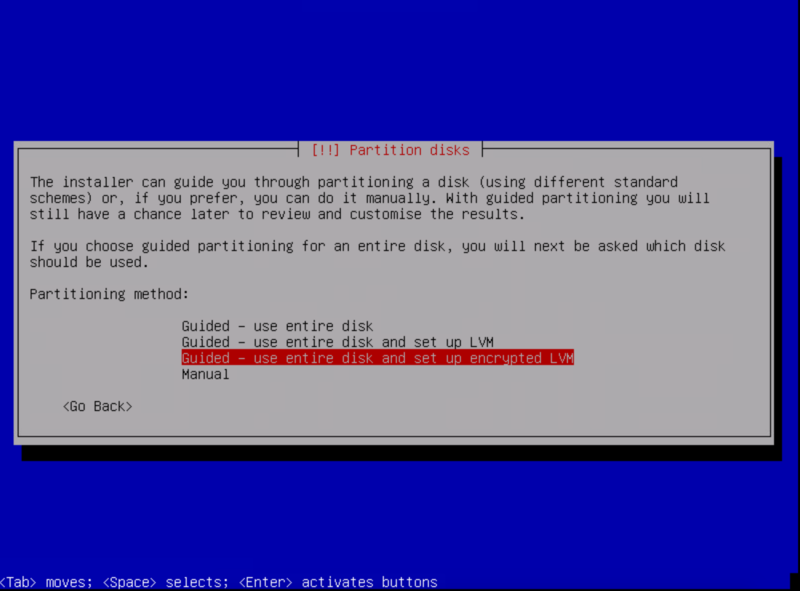 This will be done from ESXi 6.7, so if you are using a different version it may be a little different. 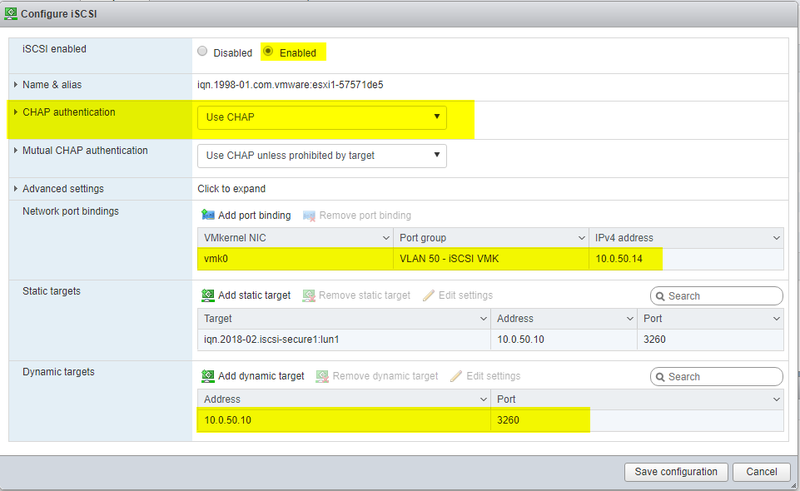 If your ESXi box has a single NIC, then you can just bind the software iSCSI initiator to your usual VMK port group. If you have multiple, you probably want to create a seperate iSCSI network. I split off a single 1G NIC from my usual setup, and made a new vSwitch called "iSCSI vSwitch"
I then added a new VMK NIC for this traffic. You do not need to add any services to it. Make sure its using your new iSCSI vSwitch. Now just edit the VM and add it to this port group. Even though this vSwitch is backed by a 1G NIC in my case, I get well over 20Gb/s within ESXi because its all on the same vSwitch and never leaves the host. Now make sure its enabled, enter the chap configuration (Make sure to enter credentials on the drop down arrow), make sure its bound the correct port, and then at the bottom enter the IP address of your Debian VM. Now just go into devices, and create a new datastore! It will show as degraded because it only has one path, you can ignore this.